Equal parts rugged and attention-grabbing, this outdoor belt stands up to the elements. 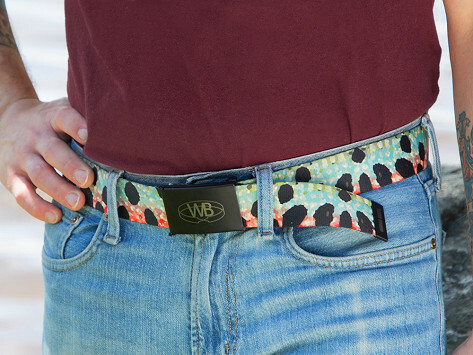 Each one is Made in the USA and shows off the style of a local American artist, weaving together color and artistry to create a more vibrant active belt. And each Wingo Belt comes armed with a bottle-opener buckle. 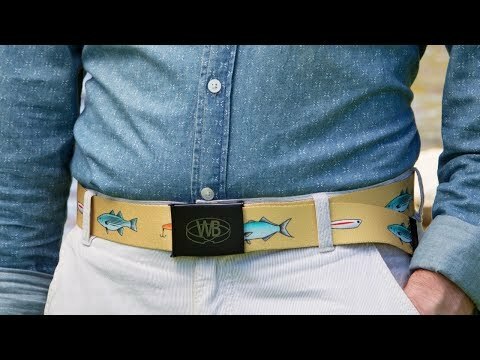 Dimensions: 44" x 1.5" x 0.1"
My husband loved this belt! A perfect gift for any angler. Made in the USA with prints designed by American artists, these outdoor belts stand out while they stand up to the elements. Maker Ted Upton’s idea was to add a vibrant edge to active belts—and keep them as tough as they are good-looking. Wingo Belts resist abrasion, water, corrosion, and odor while giving your active undertakings some flair. With designs ranging from intricate fish scale patterns to nature prints, each one is a little, personality-rich work of art. They come in a single size—you cut and heat seal it for a custom fit. And each belt has a buckle that conveniently doubles as a bottle opener. Whether you’re a hunter, hiker, survivalist, or just an all-around outdoor enthusiast, this American-made belt keeps up.